Direct imaging is one of the best ways to characterize exoplanet atmospheres, especially when it comes to Earth-sized exoplanets in the habitable zone of Sun-like stars. Unfortunately, direct imaging can be tricky and difficult for many planetary systems, which is why future missions will be dedicated to this form of detection. Looking towards future exoplanet characterization missions, like the proposed LUVOIR and HabEx, these authors use current knowledge of detection methods to determine how capable these mission will be at detecting Earth-like exoplanets, or Earth twins. Figure 1: This image shows the detected (filled) and undetected (hollow) planet for three simulated surveys. The blue dots are Earth-like; the orange are false positive Earth-like planets, and the grey dots are non-Earth like exoplanets. The top shows a survey of an ideal universe with every star at 10 pc, and planets all aligned with face-on. 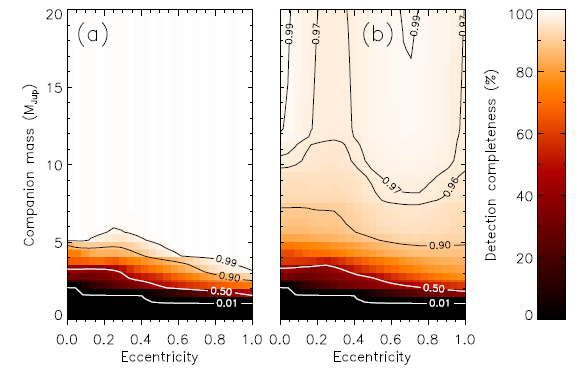 The middle panel shows a search of a universe where stellar distance and orbital inclination vary randomly, brightness varies uniformly, and the planetary phase is kept constant. The bottom panel shows a survey in a universe where distance, inclination, albedo, and orbital phase are completely random. In this paper, the researchers wanted to focus on the demographics of a mission’s yield to find how many Earth- twin exoplanets could be recovered from the data of future direct imaging projects. Earth-like exoplanets, or Earth twins as this paper calls them, are of particular interest to this field because planets like Earth are much more likely to host life as we know it. Additionally, Earth twins can give scientists information about how common planets like ours are, which could reveal how prevalent life is in our galaxy. For this paper, the authors defined Earth twins as exoplanets with 1 earth radii, 1.5 earth masses, which are orbiting G-dwarf stars, like our Sun. The important observable parameters in this scenario are albedo, the brightness of the planet compared to its star, orbital inclination, the angle at which the planet orbits its star, planet distance from the star, and orbital phase of the planet. Planets go through phases just like our moon, and at certain orbital phases, an exoplanet can be more easily detectable because of the change in brightness of the surface. These parameters were the main focus of the simulations, but there is some degeneracy associated with these features. Radius and albedo, in particular, can often be degenerate measurements for exoplanets– it is extremely difficult to distinguish between a high albedo exoplanet with a small radius versus a low albedo exoplanet with a large radius. Degeneracies in measurements like these may not affect the ability to detect certain exoplanets but could easily affect the parameter determination for the found planets. These authors first ran simulations for detections in a variety of different universes with varying distributions of detectable parameters. They assumed a telescope and method detection system similar to that of LUVOIR. After these simulations, the researchers found the detection rate for a direct imaging mission. The details of this can be seen in Figure 1. After finding the detection rate, these authors wanted to know whether the false positives were distinguishable from the true Earth twins. How Can We Distinguish between Earth Twins and Earth Imposters? False positives, or exoplanets that produce similar signals to Earth twins but do not share the same physical properties, were of great concern in these simulations. A main concern was whether the detection methods used in future missions would be able to distinguish between a false positive and a true Earth twin. Using the separation and brightness for a detected candidate Earth, the authors found the odds of a planet being a true Earth twin versus a false positive. This can be seen below in Figure 2 for both a randomized and targeted search. The golden box in each plot shows where an Earth twin could possibly fall, so any solid blue dots (actual Earth twins) that fall in the golden box are detectable Earth-like exoplanets. However, any solid orange dots (Earth imposters) that are in the golden box are the false positives in this scenario; they are indistinguishable from the actual Earth twins. Solid orange dots outside of the box are distinguishable from the Earth twins. Figure 2: This image compares the planet detections of a blind survey with a targeted search. The gold regions show the potentially habitable zone, which is where a true Earth twin would be. Solid circles are detected planets, while empty circles are undetected planets; blue circles represent Earth twins, and orange filled circles within the shaded region are planetary false positives. Assuming a randomized search, with just a single observation per star, the simulation found that 77 % of the detected candidate Earths are actually false positives, meaning that less than a fourth of the planets found in this simulated survey were Earth imposters. However, when the parameters for orbital phase were more tightly constrained, assuming previous observations had been done on the targets in this search, the odds of finding a true Earth twin improved greatly. On a targeted search simulation, only 47% of detected Earth twin candidates were false positives, which nearly doubles the odds as compared to the random search. The authors found that they could double the chances that detected Earth candidates are true Earth twins—and on average, triple the odds of observing Earth twins—by simply targeting known planetary systems where they could more easily constrain . This suggests that in the future, LUVOIR, HabEx, or any other direct imaging missions should strongly consider the targets beforehand and collect as much orbital information as possible before finalizing the target list. Although, this will improve detection rates, the authors mention that even with the best possible scenario, they cannot not get better than approximately a 50 % false positive rate. In order to improve these numbers, the authors suggest that breaking the radius-albedo degeneracy should be a focus. If the radii and albedos of planets can be constrained in this manner, than the odds of detecting a future Earth would improve even more. Detection and characterization methods of exoplanets are have been improving more and more. Using current technology and preparing carefully for future missions, by taking research like this into account, hopefully scientists will soon find many planets similar to our own, perhaps hosting life like us. Mara is working on her PhD in Astronomy at the University of Wyoming. She has done research with Heartbeat binary stars, and currently works on modeling the composition of debris disks. When not at her computer writing code, she likes hiking, baking scones, and making puns.